← I Got to Spin After All! I’m nearly done with the sparkly black merino/bamboo/firestar blend. I’m halfway through the last bobbin. The first skein came out really lovely as a two-ply. I’m spinning to a fat-ish diameter, so even though I haven’t actually checked, I think it’s about a worsted weight. I should finish this and get it plied tomorrow, if things don’t get too crazy in the kitchen. 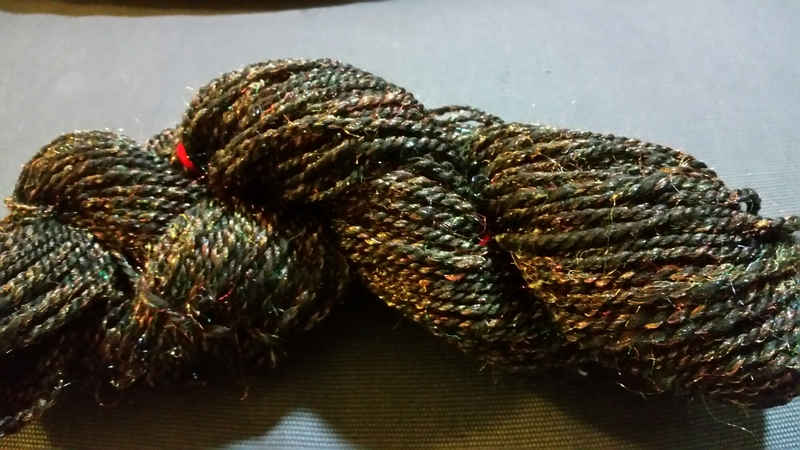 This post has a picture of that first skein. It’s extra sparkly in this light. After that, I’ve got two more different batts that I want to spin in no particular order, although one is mostly silk and I will probably do that one next. And I also want to do some hand-carding and make rolags. That has not fallen off my radar, and I need to get to it before I forget what I learned in my class last month.